I'd just finished up on Jack Reacher. I was coming back through L.A., and my reps tried to set an audition for the role of Jack McClane, because the producers hadn't found the guy. I was leaving on a plane that night, back to Australia, and I ended up having to get off the plane in order to go and test with Bruce a couple of days later. Then it was a bit of a process. I waited, went home, started another job. We'd be trading phone calls and getting updates, and when it finally came through I was just relieved. It's obviously a really iconic franchise and I was just thrilled. I couldn't wait to get out there and get to work. Was it daunting to join such an iconic franchise? People have expectations and they want films to be made a certain way to please them. There are moments when you wonder about it, but it's not exactly healthy to spend too much time focused on it. I just went out there and tried to work hard and have fun and embrace the experience. And I think the results are there — it's a lot of fun. Die Hard movies are just good, fun action films, and it's important to remember that's what you're making. How was it meeting Bruce Willis for the first time? There's the initial thought of "This is Bruce Willis!" But you just try to be respectful, run on instinct and remain professional. It would probably have been a disaster had I been starstruck, worrying too much about what he was thinking about me and how to try and impress this guy. It wasn't about that. And fortunately the environment was set up as such that we were just able to get there and have fun. We were playing a few scenes from the film and we had a ball. He's lovely guy — he's a funny guy. And I'd just come from working with Tom Cruise, so I think that probably aided my ability to let go a little bit and just kind of acknowledge that we're both actors here to do a job. Did Jack Reacher help prepare you for the physicality of Die Hard? Definitely. We had great weapons training, which was not something I was very familiar with — certainly not growing up. So that was kind of an introduction to all that stuff for me, and it helped immensely. Stunt work, as far as fights and that sort of thing, I'd been exposed to for some time, because on Spartacus we'd learn fights episodically: you'd get a new series of things to follow every time we shot. So I got quite used to getting those beats down quickly, getting in tune with that choreography and what's required, how to do things safely but also in a way that reads well to camera. That's the great thing — that you kind of pick up these little learned tools along the way and apply them to your next job. Which action scenes in Die Hard stand out to you? There's a car chase that is absolutely carnage for about 10 minutes, and watching that back I can't believe we did that! I would always walk onto set and see these structures they created, rooms that had been dressed up to look a certain way, and it was kind of amazing to think that in three days time, when we got through the scene, we'd be blowing the whole thing up, literally! It was amusing at times and hard to believe. But you can't have a Die Hard film without everything coming crashing down at some point. 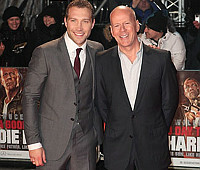 To play his son, did you try to mimic any Bruce Willis mannerisms? That was something I certainly thought about as part of my preparation, but I concluded that to get too worried about that would be a bit of a road block for me. So I just kind of trusted the fact that the relationship we were creating within the story would be enough to support that. But then I noticed while shooting that sort of thing happened organically and it wasn't necessarily something I was actively trying to do. There are definite things that have rubbed off on me. It's somewhat comical watching some of the material back and seeing that transpire without it being something you were necessarily aware of at the time. Ive always been a bigger guy — Im not going to play the lawyer or the scientist! Did you learn anything from him? Yes, you've got a job to do and sometimes it is like an education. You get the pleasure of just watching someone work and pick up on all sorts of things that that they've mastered within their craft. It's a funny thing because you do wonder what it is: what is the secret to that longevity and so much success? I think it comes down to basic things: it's a work ethic, it's talent, it's instinct. And over the years through working with incredible filmmakers, learning what makes sense. One of the biggest things is efficiency. These are guys that just know what they're talking about, they know how a shot works, how a lens works, how to perform for that. And that's something that I'm certainly very green at. I find that stuff fascinating. Did you always want to be an action star? I've always been a bigger guy. You come out of acting school and you're going for commercials or TV and you know you're not the guy that's going to book the job for the lawyer or the scientist! I guess I learned early on, even on a show like Spartacus, that those sort of things are going to opportunities, and it's easier for people to see you in certain roles than others. But I really want to enjoy doing this for as long as I possibly can, and for me that also means ticking lots of different boxes and exploring different characters and genres. Hopefully these couple of films that are more action-heavy will offer me the opportunity to do that and take on other stuff that interests me, not just gun-wielding types. Courtney is producing the documentary Be Here Now to raise awareness of non-Hodgkin lymphoma, which took the life of his friend and Spartacus costar Andy Whitfield. Recently completed projects released later this year include the police drama Felony, costarring Joel Edgerton, Melissa George and Tom Wilkinson, and the horror thriller I, Frankenstein with Aaron Eckhart.